The bald eagle is the national symbol and emblem of the United States, as well as the country's national bird. It also is on the obverse side of the Great Seal of the United States. Today we celebrate the bald eagle, on the anniversary of the day in 1782 when the seal bearing its image became official. Besides being celebrated for being on the Great Seal and for being the country's symbol and national bird, the eagle is celebrated today for its recovery after almost becoming extinct, for the values and ideals it has come to represent, and for its importance to American folklore and society. In 1776, Benjamin Franklin, John Adams, and Thomas Jefferson were tasked with creating a seal for the newly formed country. Their design was not accepted by Congress, and a few other committees were formed over the next few years where various people worked on designing the seal. Finally, after six years, a design was approved and became official on June 20, 1782. The Great Seal is attached to many official documents, such as treaties and presidential proclamations. There is an official Great Seal kept in a mahogany cabinet in Exhibit Hall at the State Department in Washington D.C., which is used to stamp the seal on documents. The obverse and reverse of the seal can also be found on the back side of the one dollar bill. The eagle is at the center of the obverse side of the Great Seal. It is holding an olive branch in its right talon and thirteen arrows in its left talon. The olive branch symbolizes the country's commitment to peace, while the arrows symbolize the country's readiness for war. The thirteen arrows also represent the original colonies. 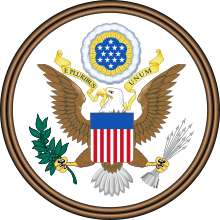 The eagle holds a scroll in its beak, on which is written the original national motto, "E pluribus unum," which means "out of many, one." This too is a reference to the original thirteen colonies, which came together to form a new country. This side of the seal is considered to be the coat of arms of the United States. American Eagle Day has gone by—or goes by—various names such as Bald Eagle Day, National Bald Eagle Day, National Eagle Day, National American Eagle Day, and American Bald Eagle Day. Regardless of its name, it takes place on June 20 and celebrates the same thing. On January 28, 1982, President Ronald Reagan issued a proclamation for National Bald Eagle Day, after a joint resolution of Congress designated 1982 as the Bicentennial Year of the American Bald Eagle, and June 20, 1982, as National Bald Eagle Day. American Eagle Day was proclaimed by President Bill Clinton in 1995, as well as by Tennessee Governor Don Sundquist, after urging from the American Eagle Foundation. Reagan and Clinton's proclamations did not make it an official annual day for the bald eagle, though, but the public has celebrated the eagle annually on today's date, nonetheless. Furthermore, almost all states have since made the day an official observance for the bald eagle. Beginning in 2007, the United States Senate started passing resolutions marking the day. If a joint resolution with the House of Representatives is passed, American Eagle Day would permanently be established. Then, a presidential proclamation would just need to be issued each year, as presidential proclamations don't renew. Bald eagles are only found in North America, and their numbers began going down after Europeans arrived on the continent. In 1782, there were between 25,000 and 75,000 bald eagles in the lower 48 states, but by the late 1800s, they began becoming scarce. This was because of a few reasons. They were seen as vermin and a threat to livestock and were shot by farmers. Others saw them as game. Western movement in the United States destroyed habitats and food sources. In 1940, Congress acted to protect the birds by passing the Bald Eagle Act. It was also around this time, though, just after World War II, when DDT began being used. It got rid of mosquitos and other small agricultural pests, but it also had a detrimental effect on bald eagles. Small animals ingested the chemical and were in turn eaten by eagles, affecting them and their eggs. Eggs became thinner, causing them to break. By 1963, only 417 mating pairs of bald eagles were left in the lower 48 states. The banning of DDT in 1972 is seen as the most important thing to help the recovery of the bald eagle. The Endangered Species Acts of 1966 and 1978 also helped with the restoration of the birds. It took more than laws to bring back the birds, though. Many birds were bred in captivity and reintroduced to places throughout the United States. The work and efforts of federal and state fish and wildlife agencies, scientists, environmentalists, conservationists, and groups like the American Eagle Foundation all were fundamental to the restoration of the bald eagle population. The birds were removed from the endangered species list in 1995, and in June of 2007 their status was changed from "threatened" to "protected." By the late 2000s, there were estimated to be 10,000 nesting pairs. Some believe there are now about 15,000 nesting pairs in the lower 48 states. Bald eagles still face threats, however, such as loss of habitat, contaminants, and diseases, so it is important that they remain protected. Bald eagles are not actually bald but have white plumage on their heads. Young bald eagles mainly have brown heads. Eagles eat fish, as well as small animals such as ducks, crabs, gulls, rabbits, and amphibians. Sometimes they chase down other birds and steal food from them, scavenge for food in dumpsters, or eat carrion—decaying dead animals. They can dive at speeds of 100 miles an hour to catch their prey, and otherwise fly at a speed of about 30 miles an hour. Bald eagles usually mate for life, after pairing up at about the age of four or five. Females lay two or three eggs, and both parents incubate and protect them from predators such as ravens, gulls, and squirrels. Both parents also feed the young, as well as build the nest the family lives in. The nests are made with sticks and lined with softer materials such as grass and feathers. They may be used multiple years, and new material is added to them each year. The nests are usually two to four feet deep and four to five feet wide. The Guinness World Record for the largest bird's nest is of a bald eagle nest. It was twenty 20 feet deep and 9.5 feet wide. Female bald eagles are larger than males, which is the easiest way to tell the sexes apart, as they both have the same plumage pattern. Full grown eagles have wingspans of about seven feet. The birds often live to be about 30 to 35 years, and it is believed the oldest wild bald eagle lived to be 38. The American Eagle Foundation is instrumental in organizing events for American Eagle Day each year. Conservation and educational organizations hold public outreach events, such as workshops and lectures, to show the importance of protecting bald eagles and other wildlife. Many citizens also celebrate the eagle in various other ways on the day. American Eagle Day, also known as American Bald Eagle Day, Bald Eagle Day, National American Eagle Day, National Bald Eagle Day, and National Eagle Day, is observed next on Thursday, June 20th, 2019. It has been observed annually on June 20th since 1982. Visit the American Eagle Foundation or learn more about the foundation in general. They put on an event each year that you could attend, but if you are unable to, there are live eagle nest cameras on their website that you could view instead, and you could donate to support the foundation's work as well. You also could look for other events closer to your home that are taking place. On your own, you could learn more about bald eagles by reading about them. One famous bald eagle you could learn about is Old Abe. You could also visit a zoo to see one or find some out in the wild. If you are interested in the historical significance of the day, you could visit the Great Seal in Washington D.C. Other ways the day could be celebrated are by flying a flag on a flagpole with an eagle on top, listening to the Eagles, or listening to songs about eagles. As it is not yet an official national day, you could write to your governor or the President, asking them to support the day. It may be even more fitting to write to the leadership of the House of Representatives, in order to ask them to join the Senate in passing a joint resolution to make American Eagle Day permanent.